Private Algernon Holliday, 13th Light Dragoons was killed in action during the Charge of the Light Brigade, and his Crimea Medal and a pair to his brother are offered for sale in our 9th December medal and militaria auction with an estimate of £11,000. Algernon Holliday was born circa 1827 in Cheltenham and he attested for the 13th Light Dragoons in Bath in 1850 and declared his age as 20. In May 1854, the regiment embarked on 5 transport ships for the Crimea. Holliday sailed aboard the Mary Anne. They arrived in Bulgaria on the 2nd June and only departed for the Crimea from there on the 1st September. 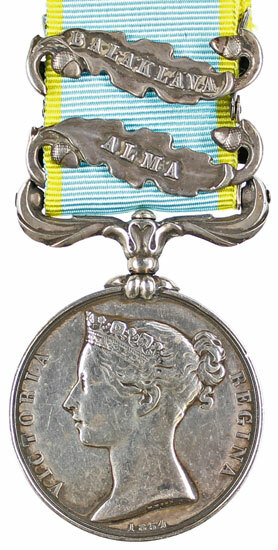 The Light Brigade protected the army’s left flank at the first action of the war at the Battle of Alma on the 20th September, but were not heavily involved. It was during the Battle of Balaklava on 25th October 1854 that the Light Brigade were to be immortalised in history when they charged the Russian guns at the end of the valley. The 13th Light Dragoons numbering just over a hundred led the charge on the right with the 17th Lancers on the left. Running the gauntlet of artillery fire from in front and from the hills on both flanks, the Light Brigade, some 670 strong, reached the end of the valley and attacked the Russian gunners still manning their guns. Heavily outnumbered, the Light Brigade then had to retreat the way they had come, subjected to further heavy fire from all sides. The 13th Light Dragoons suffered heavy casualties with 12 killed, 32 wounded and 10 taken prisoner. Algernon Holliday was one of the 12 men from the regiment killed. 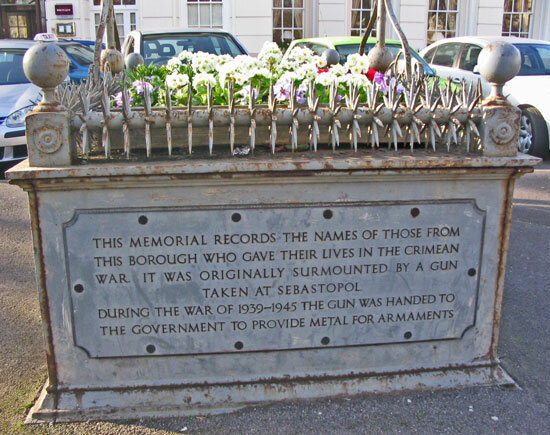 He is commemorated on the Cheltenham Crimea War Memorial which stands in front of the Queen’s Hotel. 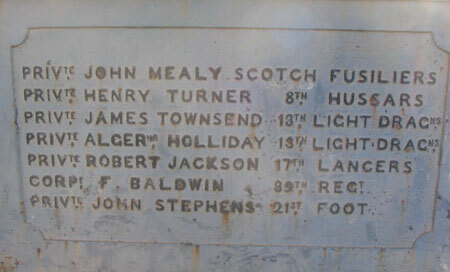 The memorial lists the men from the town who had died in the war. It was originally mounted by 2 captured cannon, but these were melted down in WW2 to help the war effort. The lot includes his brother, Charles Holliday’s 1849 Punjab Medal and Army Long Service and Good Conduct Medal. Charles Holliday was born in Badworth, Cheltenham, enlisted in 3rd Hussars 5th June 1844 aged 20, served in India for 5 years and was discharged after 24 years service in 1868.